Both Bloomberg and the AP’s George Jahn reported yesterday that the second session of talks in Vienna between the IAEA and Iran produced progress and that additional talks are now scheduled for May 21 in Vienna. But don’t look for news of this progress in the New York Times, because it’s not there. And don’t look for statements from the US praising the progress (although China did praise it) and urging further progress at Monday’s talks in Vienna or the P5+1 talks later in the week in Baghdad. Instead, US Ambassador to Israel Dan Shapiro chose to emphasize in an interview on Army Radio in Israel that US plans for war with Iran are ready to be put into action. Iran and International Atomic Energy Agency inspectors extended a round of negotiations over the Persian Gulf nation’s suspected nuclear-weapon work after both sides said progress had been made. IAEA inspectors will meet again with their Iranian counterparts on May 21 in Vienna. They ended today two days of talks in the Austrian capital. Iran and the International Atomic Energy Agency have agreed to develop a modality for further cooperation, the Mehr News Agency has learnt. The responsibilities and commitments of each side will be determined by the modality and the measures necessary will be taken based on the agreement. The process could involve grinding down the surfaces inside the building, collecting the dust and then washing the area thoroughly. 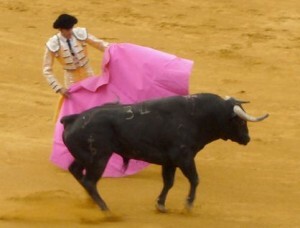 This could be followed with new building materials and paint. It could also involve removing any dirt around the building thought to contain contaminants. Some fear that Iran may even dismantle the explosives containment chamber believed to be inside the suspect building, taking it out in small pieces, if given enough time. 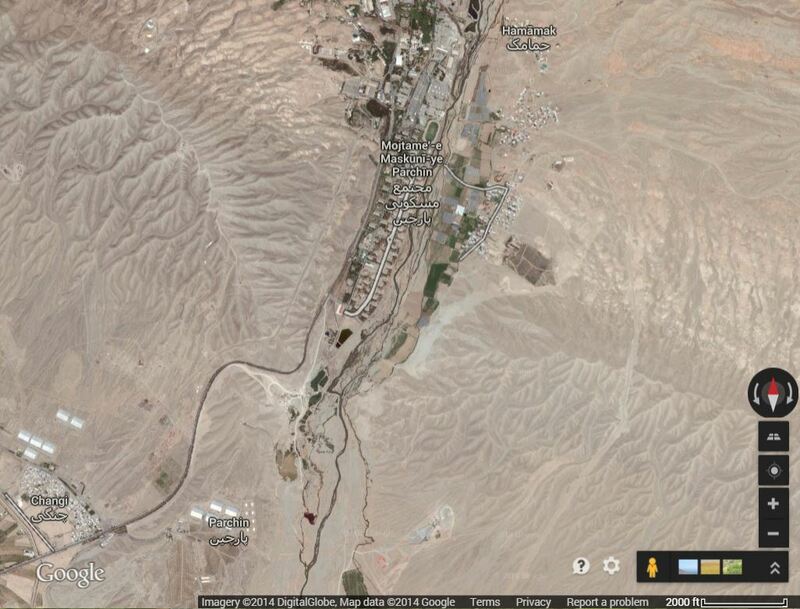 Google Maps image of Parchin, showing the dry landscape at over 5000 feet elevation. Note the extensive erosion patterns. In March, Gareth Porter and I debunked claims that “diplomats” had fed to AP’s George Jahn. 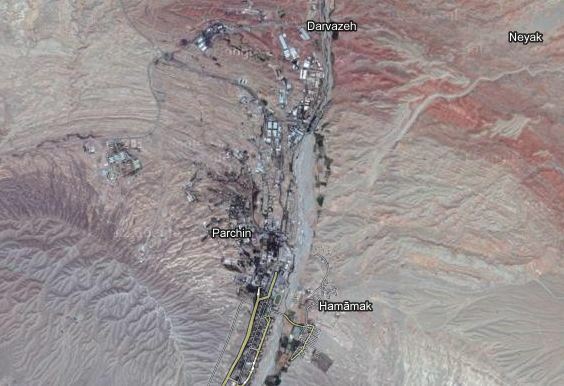 The diplomats asserted to Jahn that they had seen satellite photos depicting activity interpreted as attempts to clean the site at Parchin where they believe Iran has carried out work aimed at developing an explosive trigger device for a nuclear weapon. Perhaps the biggest problem with the depiction of these activities as being aimed at cleaning the site is that, as I pointed out in the post linked above, it is virtually impossible to remove all traces of radioactive materials from a site where they have been used. The Iranians were very quick to point this out as well. No amount of cleaning will remove all of the residual radioactivity from the building or surrounding soil. I also pointed out in my post that no satellite photos purporting to show this cleaning activity had yet been made public. 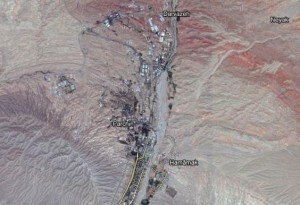 The new activity seen in the satellite image occurred outside a building suspected to contain an explosive chamber used to carry out nuclear weapons related experiments (see figure 1). The April 9, 2012 satellite image shows items lined up outside the building. It is not clear what these items are. The image also shows what appears to be a stream of water that emanates from or near the building. 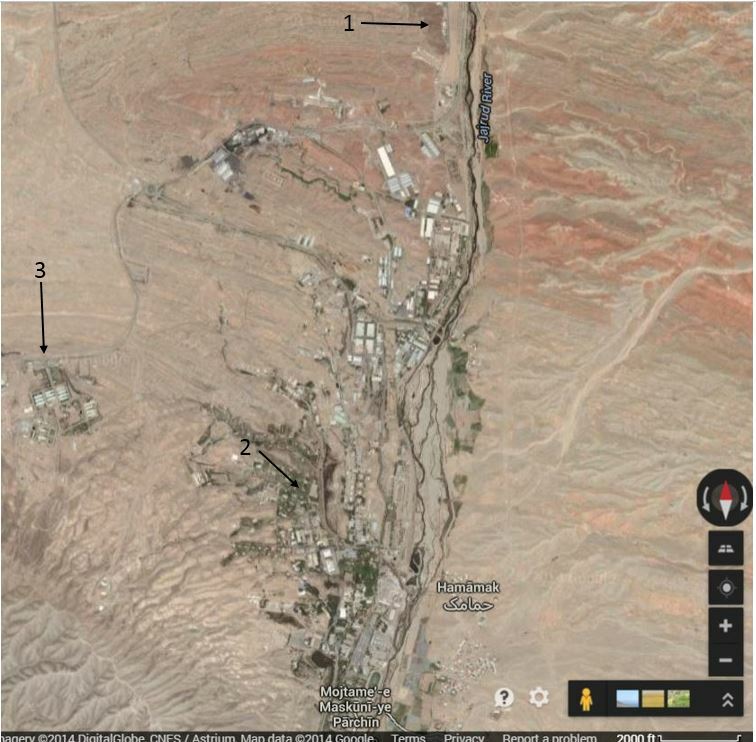 Based on new information that the IAEA received, the Agency asked Iran to visit this building at the Parchin site, but Iran has not allowed a visit. IAEA Director General Yukiya Amano noted recently that the IAEA has “information that some activity is ongoing” at the Parchin site 1. When asked if he was concerned that these activities could be associated with cleansing the site, Amano replied, “That possibility is not excluded…We cannot say for sure because we are not there.” The items visible outside the building could be associated with the removal of equipment from the building or with cleansing it. The stream of water that appears to emanate from the building raises concerns that Iran may have been washing inside the building, or perhaps washing the items outside the building. The idea that Iran would want to wash the building or its contents, presumably in order to remove radioactive contamination from trigger-building experiments, and then just allow the wash water to run onto the ground surrounding the building is laughable on its face. As I noted in my March post, the Iranians pointed out that radioactive contamination can’t be eliminated from a site where such work has been carried out. Of course they would know that merely rinsing some of the radioactive material into the ground surrounding the building would do nothing to hide it from the sensitive detection equipment IAEA would bring to an inspection. In a long interview with RT, Iran’s envoy to the IAEA, Ali Asqar Soltaniyeh, explained yet again that Iran’s position is that the team from the IAEA that visited Iran earlier this month was not the appropriate set of inspectors to visit the Parchin site. The IAEA has accused Iran of using this facility to develop technology for explosive triggers that could be used in a nuclear weapon. Iran was working under the impression that this group was meant for negotiations aimed setting ground rules for upcoming inspections. The IAEA delegation that visited Tehran recently was comprised of experts on legal, political and technical issues and not inspectors, Soltaniyeh said in an interview with Russian RT television. The group visited Iran for negotiations on reality and framework of mutual cooperation, he said. Iran does not rule out the access of IAEA to its military sites such as Parchin but this depends on some preconditions which IAEA should meet, Soltaniyeh said. In the video, Soltaniyeh also points out that IAEA inspectors did visit Parchin twice in 2005, as we were reminded earlier by Moon of Alabama. “Iran is closer to getting an (atomic) bomb than is thought,” Netanyahu said in remarks to cabinet ministers, quoted by an official from his office. “Only things that could be proven were written (in the U.N. report), but in reality there are many other things that we see,” Netanyahu said, according to the official. The Israeli leader did not specify what additional information he had about Iran’s nuclear program during his cabinet’s discussion on the report by the U.N.’s International Atomic Energy Agency (IAEA) released last week. Yup, Netanyahu is telling us he knows more about Iran’s nuclear technology than the rest of the world knows, but he won’t give us details and he can’t prove it. And, of course, it is important to believe everything Netanyahu says. Meanwhile, in Washington, Joby Warrick saw fit this morning to devote an entire article to building the case that Vyacheslav Danilenko was transferring crucial nuclear technology to Iran rather than helping Iran to develop nanodiamond technology. The accusations against Danilenko come almost exclusively from David Albright and a “report” on Danilenko prepared by Albright’s Insitute for Science and International Security. Warrick does include one brief quotation from a former CIA Iran analyst on how analysts characterize the flow of information into potentially covert programs and a statement from Josh Pollack of Arms Control Wonk. I will return to the Pollack quote below. https://www.emptywheel.net/wp-content/uploads/2016/07/Logo-Web.png 0 0 Jim White https://www.emptywheel.net/wp-content/uploads/2016/07/Logo-Web.png Jim White2011-11-14 09:57:512011-11-14 09:57:51Bibi, Albright (and Warrick) on Iran Nuke Report: "But Wait, There's More!" Yesterday, I pointed out that the IAEA is preparing to release a report on potential development of nuclear weapons in Iran almost exactly two years after the departure of Mohamed ElBaradei as its leader. 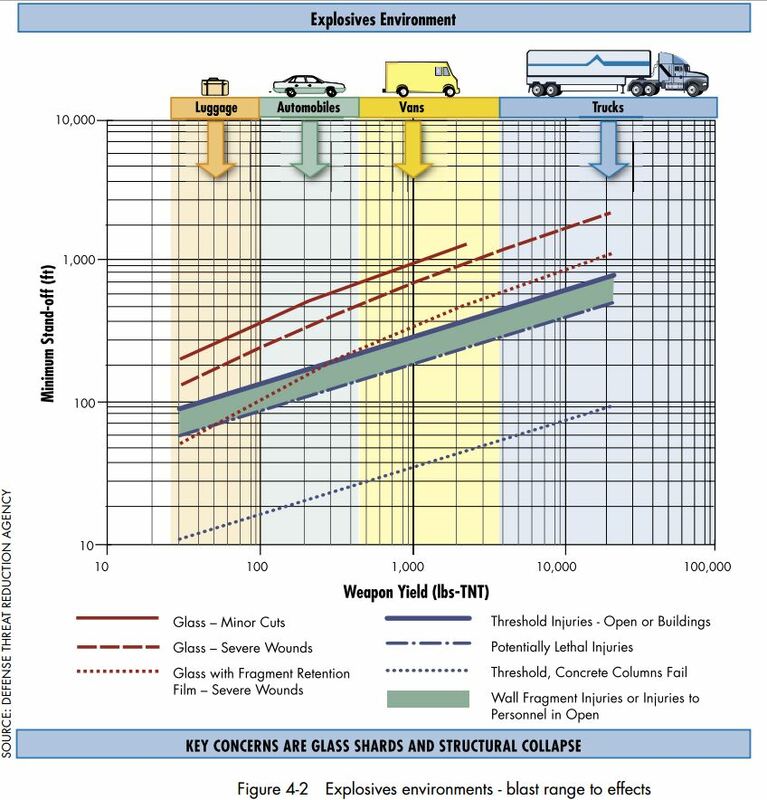 As discussed in that post, one of the key pieces of evidence that is anticipated to be discussed in the report is a large steel container in which explosions are carried out. The claim will be that this chamber is being used to test the use of conventional explosives as a trigger device for a nuclear weapon. Dr. Vyacheslav Danilenko is a well known Ukrainian (“former Soviet”) scientist. But his specialties are not “weapon” or “nuclear” science, indeed there seems to be nothing to support that claim, but the production of nanodiamonds via detonations (ppt). According to the history of detonation nanodiamonds he describes in chapter 10 of Ultrananocrystalline Diamond – Synthesis, Properties, and Applications (pdf) he has worked in that field since 1962, invented new methods used in the process and is related with Alit, an Ukrainian company that produces nanodiamonds. Some years ago Iran launched a big Nano Technology Initiative which includes Iranian research on detonation nanodiamonds (pdf). Iran is officially planing to produce them on industrial scale. It holds regular international conferences and invites experts on nanotechnology from all over the world. It is quite likely that famous international scientists in that field, like Dr. Danilenko, have been invited, gave talks in Iran and cooperate with its scientists.